Summary: Fiona Davis’s stunning debut novel pulls readers into the lush world of New York City’s glamorous Barbizon Hotel for Women, where in the 1950s a generation of aspiring models, secretaries, and editors lived side by side while attempting to claw their way to fairy-tale success, and where a present-day journalist becomes consumed with uncovering a dark secret buried deep within the Barbizon’s glitzy past. 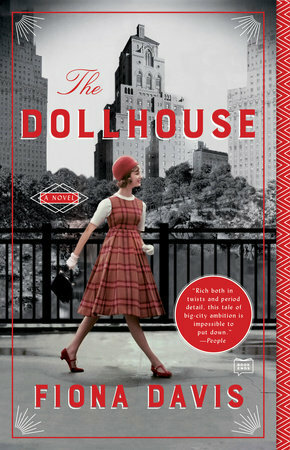 Today is the paperback release date for THE DOLLHOUSE by Fiona Davis! I read and reviewed this book when it first came out in hardcover, and I thoroughly enjoyed it. In fact, I loved how the story went back and forth between the 1950s New York City and present-day, and it was especially appealing to me that there was a bit of a mystery incorporated into the stories. I also thought Ms. Davis did an outstanding job bringing 1950s New York, and particularly the Barbizon Hotel, to life. THE DOLLHOUSE received some major publicity attention including reviews and features in Time, Family Circle, People, US Weekly, USA Today, The Associated Press, TheSkimm, New York Post, and PopSugar; and I truly believe it would make an excellent book club selection. Here's the link to the discussion guide with fifteen thought-provoking questions. I'm thrilled to say that I have a copy of the new paperback version (isn't it gorgeous?) to share with one lucky reader courtesy of the publisher. To enter, just fill out the form below before July 24th at 11:59 p.m. EST. I will randomly select and notify the winner the following day. This contest is open to those of you with U.S. addresses only. Good luck! This sounds like my kind of book! I've had this one on my list for a long time, but haven't read it yet. I did read her latest, The Address. My review should be up soon.